Twins starting pitcher Phil Hughes throws against the Miami Marlins during their spring training game at Roger Dean Stadium. 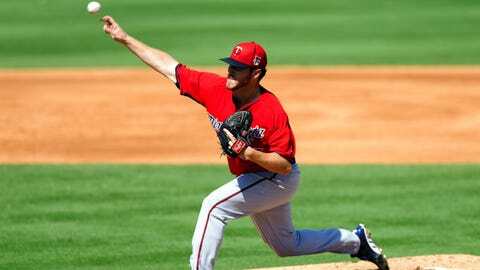 JUPITER, Fla. — With one start, Minnesota Twins newcomer Phil Hughes is already making progress more quickly than a year ago. Hughes allowed one run in 2 2-3 innings Tuesday in his debut for the Twins, who lost to the Miami Marlins 3-1. Last year Hughes went 4-14 with the New York Yankees after missing all of spring training because of a back injury. "I hope that’s a big improvement for me," Hughes said. "Everyone says these are exhibitions and you go through the motions and they don’t count, but for pitchers it’s really important to get these repetitions and build up arm strength. "I don’t want to make any excuses for the season I had last year, but I didn’t have a spring training, and it’s definitely difficult," he said. "To have a healthy spring and build my pitch count on a normal progression will help a lot." Hughes allowed two hits and one walk and struck out three. He threw 44 pitches, 25 for strikes. Marlins newcomer Jarrod Saltalamacchia hit his first home run leading off the fourth. Miami’s Tom Koehler allowed one run in two innings in his second start of spring training. The Marlins won even though they committed five errors and let an easy popup drop for a hit. "It’s sloppy," manager Mike Redmond said. "These are routine plays, too." NOTES: Hughes said his priority was to work on curves. He threw at least eight, including a pair of strikeout pitches to Christian Yelich. The right-hander allowed a walk and two singles in the second inning. "Finding a good rhythm and good sink out of the stretch today was a little tough," Hughes said. "Out of the windup, I felt my mechanics were solid." Hughes made the drive across the Florida peninsula to Jupiter on Monday night, rather than waking up early to catch the team bus Tuesday morning. He reported no alligator sightings. … "It’s hyped up, but I didn’t see one," he said. "Maybe on the way back. They said to watch out and not flip your car on one of those things." … Mike Pelfrey will start Wednesday night for the Twins against Baltimore. Ricky Nolasco will face the Cardinals’ Adam Wainwright on Thursday. Hughes said he expects to start again Saturday. …Twins assistant general manager Rob Antony said he received an encouraging report from general manager Terry Ryan, who is on leave after being diagnosed with neck cancer. "He said every day he feels better, so everything’s going in the right direction," Antony said. Ryan had surgery last month and will undergo radiation therapy. …Top Twins prospect Byron Buxton made his first start and went 0 for 5. Even so, he made a good impression by nearly beating out a couple of grounders.